This drawing is my first gift to a my dear friend of my blog.I can't wait to see it on the wall of her house!Soon I will make some other giveaway and I will invite you to participate,here on my blog! Your friend is a lucky one, to get such a nice drawing. Thank you Nanda,she said that is very happy! Felice di averti trovata sulla rete! 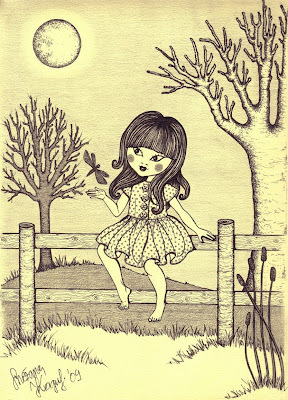 this is beautifully drawn - i love your little girls and the moon looks perfect! Ti mando prestissimo la foto. È un disegno incantevole e io mi sento orgogliosa e fortunatissima di averlo in casa. GRAZIE di cuore, mia cara Snezana.